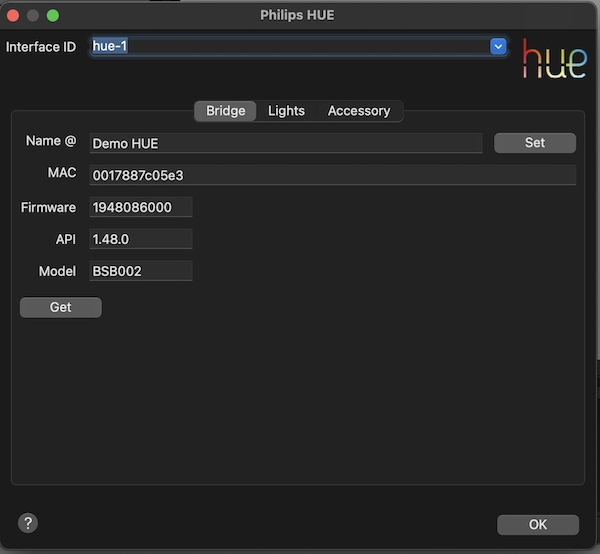 The bridge name can be changed and programmed with the Set button. Before adding a new user name the Link button on the bridge must be pushed first. If the Link button was not pressed on the Bridge an error message will show up in the Server window; Just push the Link button on the Bridge and try again. All column headers which are marked with a @ can open the @Box by a single click on it if a cell is selected. The cell contents of that column will be used to do a find. 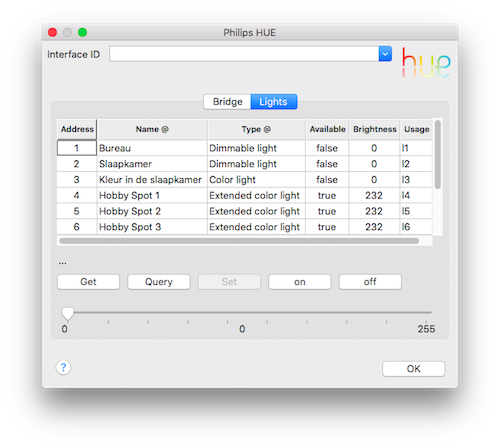 This list can be helpful for checking which lights are known, and under which address, by the connected bridge. If a Rocrail output object is found, with port type light and the matching address, it will be listed in the usage column. Get the list of known lights of the connected bridge. Command the bridge to search for new lights. This can take some time so a new Get should be done manually after a few seconds. The name column is editable. Switch the selected light on/off. Set the brightness of the selected light. A command is send after the slider thumb has been released. A double click on a color light cell will open the color chooser dialog. The selected light will commanded to set the new color.